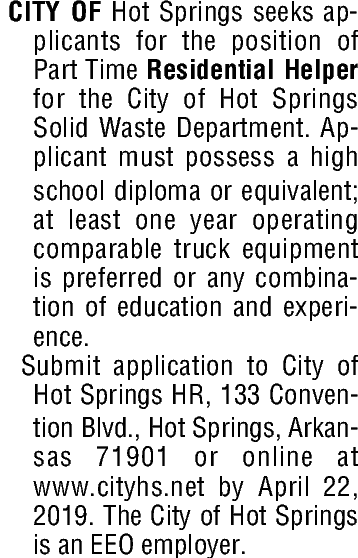 City Of Hot Springs seeks applicants for the position of Part Time Residential Helper for the City of Hot Springs Solid Waste Department. Applicant must possess a high school diploma or equivalent; at least one year operating comparable truck equipment is preferred or any combination of education and experience. Submit application to City of Hot Springs HR, 133 Convention Blvd., Hot Springs, Arkansas 71901 or online at www.cityhs.net by April 22, 2019. The City of Hot Springs is an EEO employer.